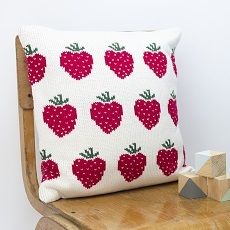 A contemporary personalised knitted cushion featuring a bright strawberries design. Beautiful handmade children’s cushion, featuring red strawberries motifs on the front with optional personalised text knitted into the cushion in taupe. Rich red with cream spots woven fabric on the reverse. The greatest care goes into selecting all components of Smitten products. The woven fabric chosen to back this knitted cushion has been handpicked to compliment the motif design and rich yarn colours shown on the front. The envelope closure on the back of the cushion is made without the use of zips or buttons so perfectly safe for little ones. The knitted cushion cover can be easily removed for washing. Our knitted children’s cushions can be customised with a name, initials or date of birth (up to 7 characters) for a unique baby gift. If you would like a personalised children’s cushion please select ‘personalised’ from the drop down menu and enter your required text in the box. If you would like to purchase a knitted cushion without personalisation, please select ‘non-personalised’ from the drop-down menu. All Smitten cushions for children are knitted in sumptuously soft ‘Baby Bamboo’ yarn (80% bamboo 20% wool) developed especially for babies by UK based yarn spinner, Sirdar. The wool content adds warmth to the yarn whilst the eco friendly bamboo fibres give it a super soft and gentle handle. Perfect for resting against little ones’ skin. Smitten cushions measure approximately 40cm width x 40cm height. Perfectly sized to add comfort to the nursing chair, bed or cuddling up on the sofa. Remove cushion pad and machine wash knitted cushion cover on a wool cycle up to 40 degrees. Iron if necessary on the reverse woven side before inserting cushion pad.